I found this recipe on the back of a bag of flour. The original version needed a few minor changes, and this recipe was the result! 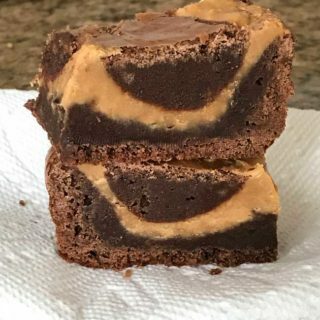 The brownies are very dense and fudge-y and have a not-too-sweet peanut butter swirl. Preheat oven to 350º F. Line an 8-inch metal baking pan with nonstick foil.. In a microwave-safe bowl, heat the chocolate and butter on high for 30 seconds. Stir and heat again for another 30 seconds. Stir and repeat until melted. Whisk in cocoa powder until smooth; set aside to cool. In a mixing bowl, whisk the eggs, sugar, salt and vanilla until combined. Whisk melted chocolate mixture into egg mixture, then add flour and stir just until mixed. Pour almost all of the chocolate mixture into the prepared pan, holding back about 1/3 cup (just eyeball it -- doesn't need to be exact). For peanut butter swirl, combine melted butter, peanut butter, powdered sugar, salt (if using, I left it out) and vanilla in a bowl and stir until smooth. Sprinkle your reserved handful of chocolate chips over the batter, then drop peanut butter mixture over batter and gently spread to cover most of the top. Drop reserved 1/3 cup or so of chocolate batter in small dollops over peanut butter batter and drag a knife gently through for a marbled look. Bake until a toothpick inserted comes out mostly clean, about 38-45 minutes (Internal temperature should top out at 212). Let cool on a wire rack. When cool, lift from pan by grasping foil. If desired, chill brownies before cutting, but serve at room temperature.